I really needed a bit of TLC this weekend. The last month or so I have felt completely helpless, buffeted about by life happening around me and it wasn’t until this evening that I finally had a chance to sit down and think. But, as I write this I have managed to find a moment or two just for me. I’m curled up on the sofa in my pajamas, a Christmas film is on and I am enjoying a rich, decadent White Hot Chocolate. 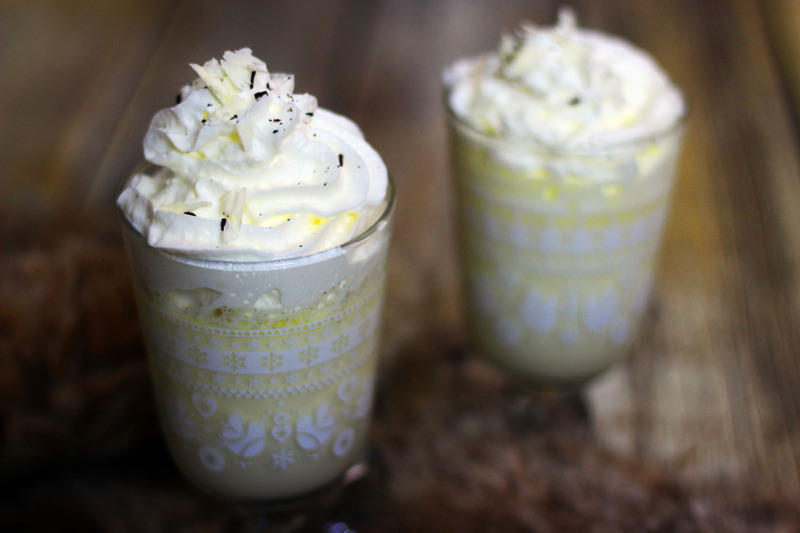 It’s made with fresh cream, white chocolate and vanilla for a smooth, sweet taste. Yes you could buy an instant White Hot Chocolate mix from the supermarket. Yes it would save you five minutes. But some things are worth the extra effort and this is one of them. I’d toyed with posting the recipe for just one serving but the likelihood is that if you’ve found a second to make a hot chocolate for yourself there is probably at least one other person lurking in the background asking if they can have one too. I’m sure they’ve been working hard too – so here’s a recipe fit for two. Simply multiply or divide as required. Pour the milk and cream into a heavy bottomed pan, place the pan on the hob and heat slowly until it is almost simmering. Place the white chocolate into the pan along with the seeds from the vanilla pod. Stir gently until all of the chocolate has melted and the vanilla seeds are evenly dispersed. Pour the hot chocolate drink into the glasses or mugs of your choice. Top with a mound of squirty cream and enjoy! In the time it has taken to drink this decadent White Hot Chocolate, that’s it, the weekend has come to an end. I’ll go to bed and wake up tomorrow for another busy week at work. Then from here on in every weekend is spent with friends or family. Jon and I won’t get another weekend alone now until our anniversary in the New Year. Whilst I do love spending time with friends and family – and I really do, after all that is what Christmas is all about – I’ll be savouring the odd 10 minutes over a hot chocolate. After all, everyone needs a bit of “me time” once in a while and this recipe is a real treat. How do you find the time and space for a moment of reflection over the crazy Christmas period? I’m sure I’m not alone! Leave your comments below. Haha I know that feeling Emily! Fortunately we used up all the cream so it’s just the one this evening! Probably for the best… White chocolate is most definitely my favourite though. This hot chocolate looks like the perfect way to unwind and to face the next six weeks before the holidays! Wow, time is indeed flying! 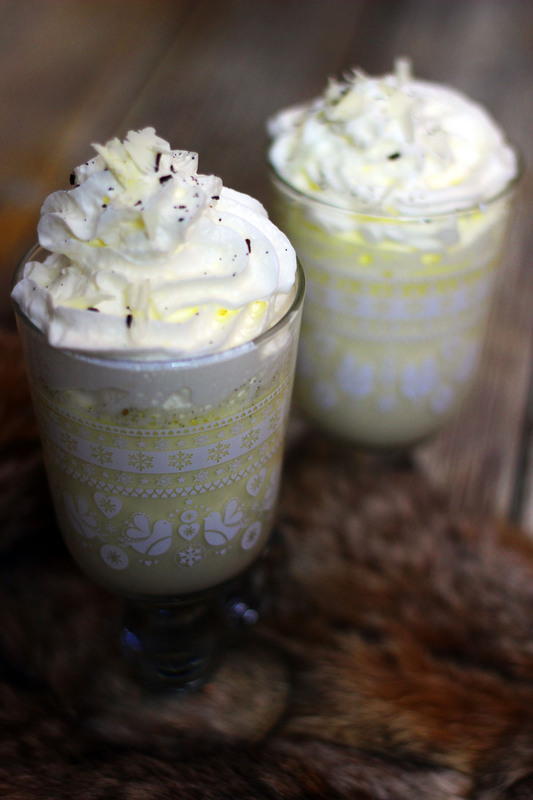 By the way, your photo of the hot chocolate in the glasses is lovely! Hope all is well with you !!! Winter’s here. So go on push one over this way. SLURP!!!!!!! Alas I’m not a white chocolate fan but my kids would LOVE this! I want to know where your glasses are from? So cute. :O Claire! Maybe this recipe would change your mind? The glasses are Asda’s own 😉 they did them with a red fairisle pattern last year too! Simply delicious.I love the creamy swirl ,it adds a perfect finishing touch. what a simple but lovely dessert. I love the glasses you’ve served them in too! love the blog too! It’s basically love all round!